I listened to this audiobook from Audible on my iPhone over vacation and while commuting. At Home is a wonderful collection of trivia about the objects in and around our home and our homes themselves. It does not delve into the type of details that A Short History of Nearly Everything does, but includes a lot of interesting Tidbits. I don’t have much else to say about the book, I found it interesting and a good listen but it did not wow me. As an audiobook I rate this 6 out of 10 and recommend it to people that enjoy trivia about the origin of things in and around their home. I read The Kings Dragon while on vacation recently and really enjoyed it. 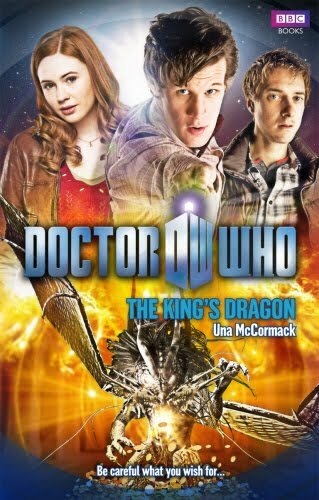 Written by Una McCormack and featuring the Mat Smith Doctor with Amy and Rory. The Doctor’s curiosity is peaked when he discovers the town of Geath covered in gold even though gold does not exist naturally on the planet. And to top it off Geath now has a king after thousands of years of self-rule. The pace of this book is a little slower that other recent Doctor Who books, it was kind of nice slowing down a bit. In the city-state of Geath, the King lives in a golden hall, and the people want for nothing. Everyone is happy and everyone is rich. Or so it seems. When the Doctor and Amy look beneath the surface, they discover a city of secrets. In dark corners, strange creatures are stirring. At the heart of the hall, a great metal dragon oozes gold. Then the Herald appears, demanding the return of her treasure – the ‘glamour’ – and next come the gunships. The battle for possession of the glamour has begun, and only the Doctor and Amy can save the people of the city from being destroyed in the crossfire of an ancient civil war. But will the King surrender his new-found wealth? Or will he fight to keep it? A thrilling, all new adventure featuring the Doctor and Amy, as played by Matt Smith and Karen Gillan in the spectacular hit series from BBC Television. I rate this book an 8 out of 10 and a good read for any Doctor Who fan. I had a great time at the workshop and learned a lot. I have posted a few more pictures. This is Dana posing on a Steamer trunk. I have finally finished reading this book after loosing it in a piece of luggage for a couple of months. I did not have LEGOs as a child; my interest in them began as a means to build robots and prototype enclosures for electronic gadgets. My interest grew quickly after buying a couple of small kits and now I am putting kits together on a regular basis. I am currently in the middle of building the 8070 Supercar. LEGO: A Love Story is a first hand account of Jonathan Bender’s journey into LEGO as an Adult Fan of Lego (AFOL) and the people he meets along the way. He attends conventions devoted to lego, travels to LEGO headquarters in Denmark and Connecticut, to Legoland in California, and meets great fans of LEGO everywhere he goes. Jon’s passion for LEGO is clear and the way it brings him closer to his wife and father are inspirational. There are 62 LEGO bricks for every person in the world, and at age 30, Jonathan Bender realized that he didn’t have a single one of them. While reconsidering his childhood dream of becoming a master model builder for The LEGO Group, he discovers the men and women who are skewing the averages with collections of hundreds of thousands of LEGO bricks. What is it about the ubiquitous, brightly colored toys that makes them so hard for everyone to put down? I rate this book a 7 out of 10 and recommend to any AFOL. Jonathan also shares some of his family’s difficulties with getting pregnant and having a child. My wife and I went through a similar experience and I found myself feeling very emotional during that part of the book. One of the situations they experience mirrored ours and it really hit me hard. Also similar to our experience, they were eventually blessed with a baby. I wish them the best of everything and hope they enjoy JEGO for a long time to come.